Enough is Enough breaking communal & social barriers! End Gender Based Violence through Education! Our Sub-Altern Heroes of Pakistan-Nargis Hameedullah! 19 Years old Karate Champion Quetta, Balochistan - Defying Traditions for National Pride! “I always wanted to be the one to bring about a change,” Nargis told Al Jazeera. “I’m very happy to be able to write my name in history”. Oh there are so many Firsts for Nargis Hameedullah and for Pakistan! 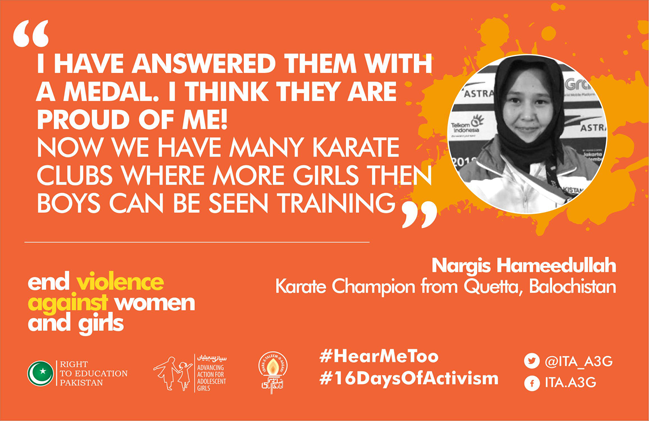 Nargis at 19 years of age is the first female karate instructor of Quetta and has represented Pakistan internationally. On August 25, 2018, Nargis defeated Napal’s Karki Rita 3-1 in the match played for Bronze medals at the Asian Games 2018. Her eyes are set on bigger wins. She won a gold medal in the South Asian Championship in Colombo, Sri Lanka in 2017. She is part of Pakistan Female Karate Association. But nothing comes easy for girls and especially from the Hazara community. Nargis has just cleared her FA (Grade XII) with flying scores. But, Nargis has had to fight for her dreams all her life - both on and off the field. Nargis a nationalist to the core said "I want to raise my country's flag with an Olympic Medal; to hear the national anthem being played with everyone standing up in respect!